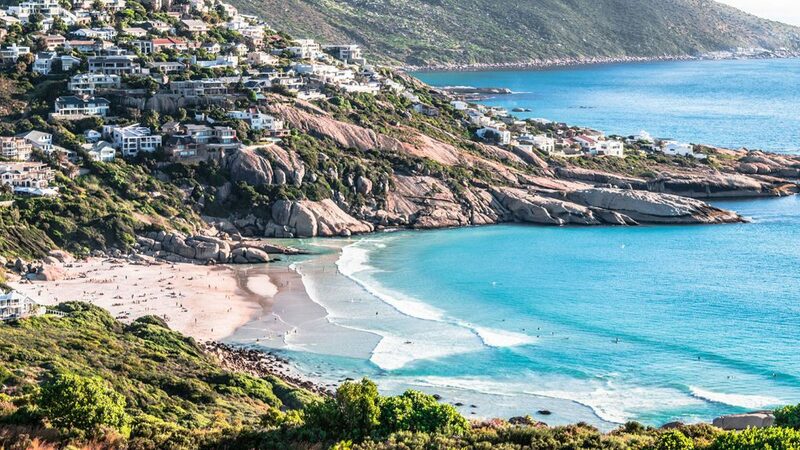 Llandudno is a popular 200 m Blue Flag Beach, situated on Victoria Road. Parking is available for 35 vehicles. 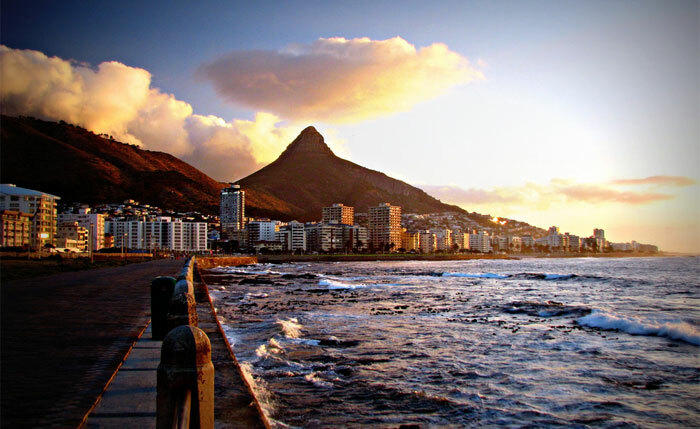 It is undoubtedly one of Cape Town’s most picturesque beaches. 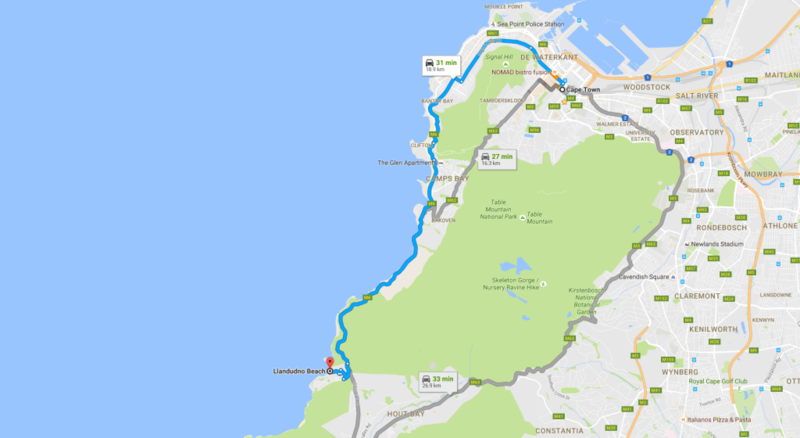 Motorists driving along Victoria Road on the way to and from Hout Bay can stop at the lookout site to gaze down on an enticing white beach, and admire from afar the exclusive suburb’s architectural showpieces clinging to the steep slopes. From the water’s edge, the setting is even more appealing, with the beach framed by natural bush, and Judas Peak and Klein Leeukoppie (‘little lion’s head’) rearing up on either side to form a dramatic mountain backdrop. Few people venture into the water for more than a quick dip, because the sea is usually icy cold in summer, the currents strong, and the power of the breakers sometimes intimidating to all but the most confident of surfers and bodyboarders. The beach is popular for sunbathing and sundowners, though some people opt for the surrounding granite boulders, which retain the sun’s heat, and provide a great view of the sun setting over the sea. The rocky headland to the left of the beach is known as Sunset Rocks. The Logies Bay promontory to the right of the beach has several caves among the granite boulders, which were used by Khoisan ‘strandlopers’, as evidenced by a nearby shell midden excavated in 1953. 20 cars. Visitors often park in one of the side streets, and take a walk down the steep road to the beach. Residents have agreed that the beach be kept dog-free between 09:00 and 18:00 from 1 September to 31 March. Dogs are prohibited on all Blue Flag beaches between 10:00 and 18:00 during the Blue Flag season which is 1 December to 31 March. Ambulating along Sea Point’s wide, paved and grassy promenade is a pleasure shared by Capetonians from all walks of life – it’s a great place to observe the city’s multiculturalism. There are kids’ playgrounds, a well-maintained outdoor gym, and several public art works that are worth taking the time to see. The coast here is rocky and swimming is dangerous, although you can get in the water at Rocklands Beach . If you’re too thin-skinned for the frigid sea, there’s Sea Point Pavilion , towards the promenade’s southern end.